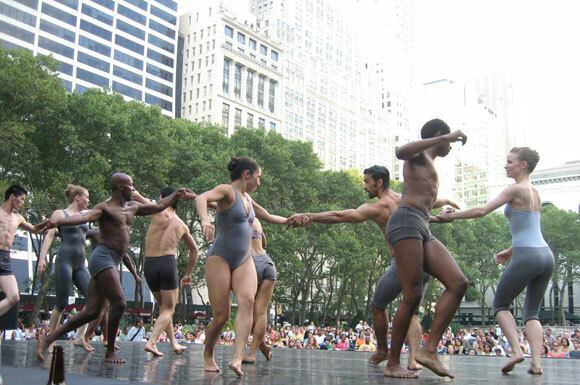 Spend your next two Friday evenings in the park for a taste of culture with free modern dance performances. The park will host these events on the stage overlooking the lawn. First up this week is the Booking Dance Festival Edinburgh, back again for their second annual performance en route to the Fringe Festival in Edinburgh, Scotland. The performance in the park will feature eight distinct modern dance companies: DAMAGEDANCE, Gehring Dancetheatre, Clyde Forth Visual Theatre, Sasha Spielvogel/Labyrinth Dance Theater, Michael Mao Dance, Freespace Dance, Rebecca Stenn Company, and Ballroom Dancing for Tough Guys. The following week, New York City based dance company Ballets with a Twist presents Happy Hour. This clever work, inspired by classic cocktails like Martinis and Margaritas, is perfectly timed for an after work viewing. If our prediction is correct, you will be inspired by choreographer Marilyn Klaus' work to seek out a few cocktails of your own. May we suggest 'wichcraft at the Southwest Porch or the Bryant Park Cafe.